I downloaded this book as an audiobook because I’d heard the sample and listening to Sue Perkins read her own book had me sniggering – from just the sample. I couldn’t wait to hear the whole book. And it didn’t let me down. I know I need to read more non-fiction and this was a great start. Sue is brutally honest. I don’t think there’s much point in writing these things if you’re not going to be. But, the way she tells you the stories, either has you reaching for a tissue to wipe your eyes, or reaching for a tissue to wipe your eyes! The book travels all the way from childhood to present day, sometimes jumping about between the two when a moment reminds her of another. But, you never feel lost and she always brings you right back to where you were originally going. The detour always felt worth doing. You find out how hard she worked to be where she is now. No, she didn’t just turn up on British Bake Off, already made, like instant cuppa soup, she worked hard beforehand. If you don’t know her work history there are some funny moments that get you through from start to finish. There are also some seriously personal moments in the book. Very personal and having Sue read it to you in the audio format, makes it feel even more intimate. A sharing of your life, verbally this way must be strange. Writing it down, you’re somewhat detached from it once you press send to the editor and then the publisher, but standing there in the audio booth, reading the work you’ve already sent off, must have been a very strange experience indeed. Though, the simplicity with which she approached everything, factually, and with good humour, must have helped. There are, of course, very many funny moments. Moments that had me doing this. And, it wasn’t always appropriate or seemly for me to be doing that. Not with where I was sitting listening to it! 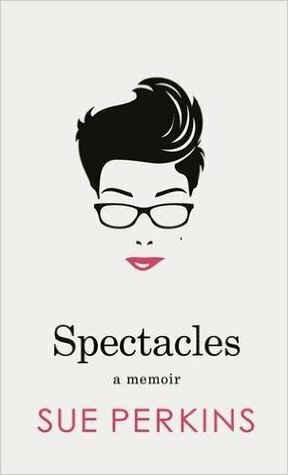 I’d recommend Spectacles and I’d listen to another autobiography on audiobook if it was read by the author as it definitely adds to the experience. They know how they want it to sound, how the tone of the paragraph is supposed to be. It’s their life, they lived it, there is emotion and meaning in there. If you enjoy seeing Sue, wherever you have come across her, then I really do think you will enjoy this book, in whichever format you read it, but the audiobook is a real treat. Do you read many autobiographies? Whose have you found to be really interesting? I’d love to know. That’s a good idea – I really like Sue Perkins and was planning to read this, but now I think I might go for the audiobook instead! I think if you’re going to read it you’d get more from it by listening to her tell her own story. Let me know what you think. Do you have an audible monthly pack or do you just buy when you fancy them? I’m wondering whether to go for a subscription. It sounds like a deeply honest story, Rebecca, and those are definitely the kind that can have you laughing one minute and tearing up the next. I’ve not read autobiographies just lately; this sounds like a good ‘un, and I’m very glad you enjoyed it. I don’t tend to read autobiographies, Margot. It’s one book I really haven’t delved into and I found it a fascinating read. Like I say though, listening to the author herself, tell her own story, I think made it a better book for me. I’ll definitely read more that way.